Lady Polish's birthday was April 7th, so I spent most of my time shopping for her at Justice. But what is it that always catches my eye at the checkout counter? Nail polish, of course. This time around, I noticed that not only did Justice carry magnetic nail polish with a variety of patterned magnets, but there were also glitters. Since everything was 40% off, I snatched up a purple with red glitter and stashed it in my swatch drawer as soon as I got home. At $8.50 each before the discount for a 0.25 fl oz bottle, considering China Glaze and Color Club's $10 and $12 price tags, respectively, for a 0.33 fl oz bottle. The nail polish went on pretty smoothly, though was a little thick. That seems to be pretty common with magnetic polishes, though. The magnet was very strong, so strong that you really have to watch how long you hold it, as the polish is literally drawn up OFF THE NAIL towards the magnet. It was crazy to watch. The color was pretty, though I wish the red glitter was a little more prominent. It also had a little bumpy of a finish, though I suspect a coat of Seche Vite would take care of that. I liked the star magnet a lot. You can see that I moved it all around my nail to show you the different ways it looked, depending on where you held it. Like most magnetic nail polishes, it takes a little practice. In the end, at $5.10, the Justice Magnetic polishes were well worth it at more than half the price of the big brands, like China Glaze, Color Club, Nails Inc, etc. The only issue is that you have to either snag a 40% off coupon OR be in the store during the 40% off everything sale. That being said, those sales aren't exactly hard to come by at Justice, as those of you who have younger siblings or children will attest. 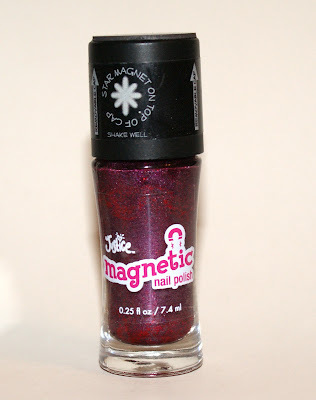 Ten times out of ten, I would opt to buy the Justice Magnetic polishes over the kind of found at Claire's, which was such a disaster that I could not even swatch it. Never dried, lumpy, just disgusting. They offer Purple Shimmer, Purple, Turquoise, Red, and Blue shades. So what do you think, everyone... will you be trying these out? Are you a subscriber to Julep Maven? There is a magnetic polish in this month's box! I can't wait to get it, I have been meaning to try out the trend, but didn't want to spend a fortune to do so! This purple by Justice is pretty! Walgreen's has Nabi Magnetic nails for $4.99 retail. There are some lovely colors, at least 10-15.